-Bill to and Ship to Address (street address preferred for shipping). -Size (include Neck and Sleeve). -Description (include Collar Style and Fabric). -MC/VISA or AMEX # and exp date. To be safe, we suggest you call us with your credit card #. You may also fax to 406-794-0202. If email, which is not secure, we suggest you split information into two or three separate emails. -any Special Requests or Questions you may have. In order to make fax or mail ordering easier for you, you may wish to download and print our order form-available as an Acrobat .pdf file, which requires Adobe Acrobat Reader. Don't have the Adobe Acrobat Reader? Download for free at: Adobe's web site. 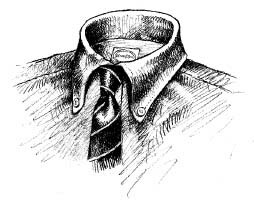 Our trademark SofCollarstm . Made in U.S.A Since 1982. Authentic Ivy League Look. G.Bruce Boyer. Unlined, Non-fused, Classic Full Roll 3 7/16" Button Down Collars. Better than Brooks Brothers. Two-Ply, Yarn-Dyed Pima Cotton Oxford, 2 7/8" Straight Point Collars, Generously Cut. Exceptional Comfort. Traditional Good Looks. Hard-to-Find Sizes, Sea Island Broadcloths, English and Italian Superfine Shirtings, Solids, Stripes, Checks, Plaids, French Cuffs, Contrast Collars, 'J.Press' Flap Pockets, Big and Tall Sizes, Single Needle Stitching. Custom Tailoring. Impeccable after 150+ Launderings. Classic Pima Cotton Oxford Boxers. All American Made. Guaranteed to Outlast All Others.